Maurice Harland writes May 2016 with his memories of the village pond in 1940’s.The pond claimed a couple of incidents. Ernest Teale who worked at Thirkills, ventured on to the ice and fell through, a ladder was brought from Thirkills and pushed out onto the ice to allow him to climb out.Another occasion during winter, Jim Wright was operating the snow plough with 2 horses, he couldn’t control them, and they bolted down the village and ended up on the ice on the pond. They were all right until they joined together and then they fell through, but eventually they managed to walk out.A lot skated on the ice and played ice hockey. It seemed to freeze for a long time. If you have any memories or photos of the pond please contact us. 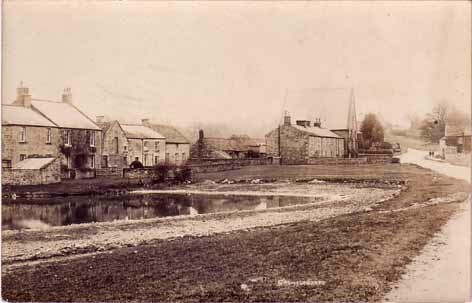 Photo sent by Richard David [April 2019] of Grewelthorpe Pond about 1900. 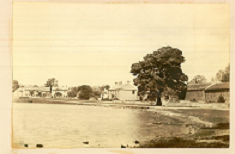 This postcard of the village pond is believed to be from the early 1900s. If you have accurate information on the date please let me know using the form below.